After reading the rules, I remembered I had some leftover Shepherd Sock from the Slytherin socks. It seemed like a perfect project to work on during the forthcoming weekend’s trip up north. So I packed myself a “design kit” plus one extra project (you never know, right?). 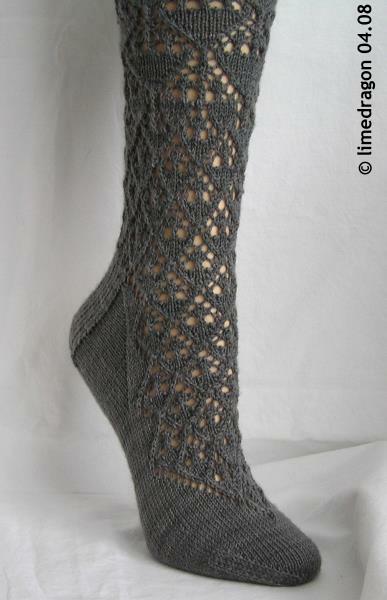 You see, ever since I <a title=”Rocky Lace (Same Window)’ href=”http://limedragon.com/2008/02/29/english-crystal/”>knit the English Crystal Design from Kinzel’s First Book of Modern Lace Knitting, I’ve thought it would be interesting to rework this motif for socks. So I decided I’d try and give form to my visualization during the long weekend. It took a while; two challenges I struggled with were 1) not second-guessing myself (should I let the stitch pattern spiral, or not? ), and 2) figuring out a nice transition between the large and small motifs. Much tinkering, knitting, tinking, re-knitting, and frogging ensued until I achieved the result and look I wanted. 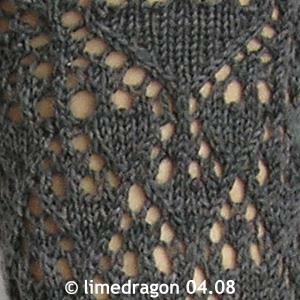 The taper point of the lace pattern wasn’t planned… I originally envisioned lace all over the instep, but the strong diagonal lines begged me to try tapering it, and I was pleasantly surprised by the results. Once the sock, pattern, and charts were complete, I mailed them off, and waited. One day in late May, I got an email telling me that I had won. I won? Once I got over my shock, I ran around screaming excitedly (well, ok, not really), but I was giggly! 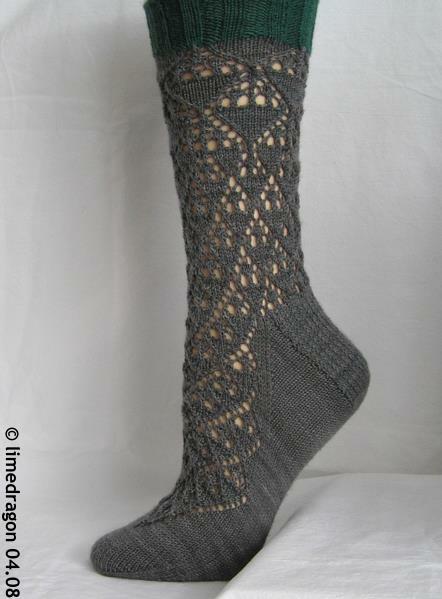 Wow, gorgeous sock — many congratulations on a well-deserved win!! Whoa – you are just a design machine!! It’s beautiful and it’s a well-deserved win! CONGRATS! They are absolutely amazing and I love the pointed lace coming down the foot. That makes it just Brilliant! I’d be jumping up and down too! now, how do I get the pattern? Congrats! It’s no wonder you won… the sock is GORGEOUS!! That is fantastic! Congratulations for a job well done! Woohoo! Congratulations! What a beautiful design. Wow! Just WOW! Man! And just when I was thinking I was breaking away from socks! Can’t wait! Congratulations! I love those socks – they are so gorgeous. OMFG! Gorgeousness! Now how do I get my hands on the pattern? Wow, that is a gorgeous sock! Congratulations on a well deserved win! It’s beautiful, well worth the effort and well deserving a win. Sorry for being late on my congratulations, I’m a bit behind on my blog reading.